Hoax victims afraid to discuss their misplaced DDT & malaria anger . . .
We see it almost daily — probably because we’ve got searches set to find comments on malaria and DDT. British robin, or robin redbreast. Image found on Pinterest, and also ironically used to illustrate Pointman’s screed for DDT. 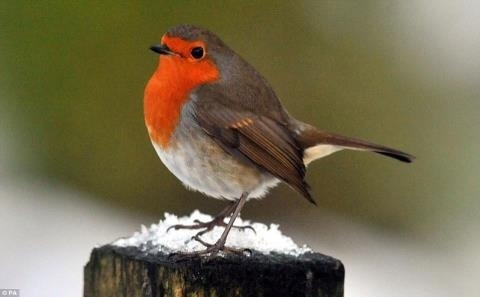 Ironic, because Britain didn’t use as much DDT, and European robins were not so badly affected as U.S. robins. Not sure if Pointman knew that and used the photo to intentionally mislead, or if he’s just really bad at identifying species. Some well-meaning guy (or woman) writes a long piece about conscience, and then claims to have lost respect for science, or medicine professionals, or the World Health Organization (WHO), or Rachel Carson or environmentalists, or all of them at once, because Rachel Carson’s ban on DDT meant malaria infections and deaths exploded, and libruls just won’t allow anyone to fix it. DDT resistance arose by 1948, and though Rachel Carson had hoped it wouldn’t, mosquito resistance to DDT caused super mosquito killer Fred Soper to end WHO’s malaria eradication program in 1963. That’s one year after Rachel Carson’s book, Silent Spring, was published, and nine years before the U.S. banned DDT use in agriculture in the U.S. (Soper quit all “eradication” activities by 1965; WHO formally ended the program in 1969. By the way, Soper was no friend of Carson, and didn’t like her book.) Today, every mosquito on Earth carries alleles that make it resistant or immune to DDT. Rachel Carson wanted to cut back on non-disease-fighting uses of DDT, in order to prevent disease vectors like malaria-carrying mosquitoes from developing resistance. She wanted to save DDT to fight malaria, not ban it. When the U.S. eventually got around to acting against DDT, it was years after mosquito resistance had ended WHO’s campaign. EPA resisted action at first, spent most of 1971 with an administrative law hearing on changing the label for DDT, then issued a rule limiting DDT use to fighting disease effective at the end of 1972. When EPA regulated DDT, the regulations applied only to the U.S.; the only nations that also banned DDT use on crops were nations where there was no active malaria problem. DDT was never banned in Africa, nor Asia, nor is it banned today under the Persistent Organic Pollutants Treaty (POPs, or Stockholm Convention), for any nation who wishes to use DDT. When EPA regulated DDT, EPA countermanded the federal law and court orders that prohibited manufacturing of DDT in the U.S. Chemical companies dedicated all their DDT production to export, to fight disease. EPA’s order allowed DDT use to fight malaria in any US state or territory; it was a ban on spraying DDT on crops. When Fred Soper ended WHO’s ambitious malaria eradication campaign in 1963, malaria was nowhere near eradication. WHO estimates 4 million people died each year from malaria around the world, and a half-billion, or 500 million people suffered malaria infections in a year. Despite WHO’s getting out of the malaria eradication business, people still fought malaria. Better medical care, better housing, decreasing poverty and sheer will power cut the malaria death toll to between 2 million and 3 million per year, by 1972, the year the U.S. banned DDT on crops. Malaria deaths and malaria infections fell steadily until the 1980s, when malaria parasites developed resistance to the pharmaceuticals used to cure the disease in humans (most DDT advocates appear to forget that curing humans is the most important part of any malaria-fighting program). Then malaria deaths stayed mostly steady, with slight increases, until 1999, when WHO and a variety of other organizations took advantage of new pharmaceuticals and newly-developed drug administration programs, and the availability of cheap, insecticide-impregnated bednets, to make major assaults on malaria again. Between 1999 and 2015 WHO estimates, malaria deaths were cut 45%. Malaria collapsed, not exploded. From 1963’s ~4 million annual deaths to malaria, annual death toll in 2014 was less than 600,000. Deaths were cut by more than 80%. From 1963’s 500 million people infected, totals fell to fewer than 220 million in 2014. Infections were cut by more than 55%. EPA’s regulation cannot travel back in time to cause an end to WHO’s malaria eradication campaign (1963) nine years before the rule was made (1972); nor can history and international law be changed to make EPA’s campaign stop the use of DDT outside the U.S.
Mosquitoes do not migrate thousands of miles, across oceans. EPA’s ban on spraying U.S. crops with DDT, chiefly cotton, did not cause mosquitoes to migrate from Arkansas to Africa to spread malaria. Had they done so, DDT in Africa had a pretty good chance to getting them, anyway. A reduction of malaria deaths from 4 million to 584,000, is not an increase in deaths. These impossibilities do not even act as speed bumps to people in a hurry to condemn science, Rachel Carson, malaria fighters and environmentalists, in a mad rush to praise DDT, a deadly poison that doesn’t do what we hoped it would, any more. Those undeterred from slandering Rachel Carson and environmentalists often don’t want to be informed of any errors in their rant. And so, Pointman, with a nasty false indictment of science, law and environmentalists, refuses to allow my posts to correct his errors. His screed here. It contains at least 6 gross errors, repeating all the impossibilities listed above, and slandering both Rachel Carson and William Ruckelshaus as “mass murderers,” with the false claim that EPA stopped DDT use against malaria. My response, dealing with a small part of the errors, below (and here at Pointman’s blog; but in moderation, so you can’t see it, at the time of this posting). EPA’s order banning DDT use in the U.S., on crops, specifically lifted the court-imposed ban on DDT manufacture, and specifically allowed use of DDT in the U.S. or anywhere else on Earth to fight vector-borne diseases — that is, malaria. DDT manufacture continued in the U.S. until late 1984, when a new law made DDT manufacturers responsible for not poisoning their neighbors and neighborhoods. Most DDT manufacturing arms of larger chemical companies were spun off as separate enterprises, and they declared bankruptcy rather than assume any liability for the poisons they made for huge profits. I waited several days, and send two notices asking to spring the comment from moderation. I don’t think “Pointman” is interested in discussion. Further reflection, a further thought — “Pointman” probably is not interested in discussion, not because he fears it — he’s probably armed, what does he have to fear? — but because he no longer cares. He’s seen the effects of good intentions gone wrong, and if it ever occurs to him it’s not his intentions, nor his going, that might be wrong, he’ll never let on. William Souder’s biography of Rachel Carson On a Farther Shore, was a finalist for a Pulitzer. On Rachel Carson’s birth’s 100th anniversary, he explained the hoaxes against her. What really happened in Sri Lanka (Ceylon)? It wasn’t a ban on DDT. Tim Lambert explains. This entry was posted on Monday, July 20th, 2015 at 3:05 pm and is filed under DDT, History, History of Science, Malaria, Rachel Carson. You can follow any responses to this entry through the RSS 2.0 feed. You can leave a response, or trackback from your own site.